The Federalist Society will host Judge Ken Starr on Monday, Feb. 16, at 12:30 p.m. at the School of Law, Malibu. School of Law dean Deanell Tacha will introduce Starr, who will give a presentation on his book, First Among Equals: The Supreme Court in American Life. 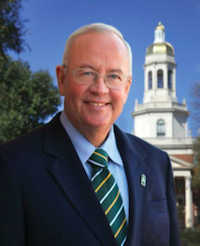 A distinguished academician, lawyer, public servant and sixth-generation Texan, Judge Ken Starr serves as the chief executive officer of Baylor University holding the titles of President and Chancellor. On June 1, 2010 Judge Starr began his service as the 14th person to serve Baylor University’s president and was named to the position of president and chancellor on November 11, 2013. In providing the additional title, he is charged with the task of increasing Baylor’s influence in the nation and around the world. Association of Independent Colleges and Universities (NAICU) and currently serves as President of the Southern University Conference. In addition, he serves as a member of the Board of Trustees for the Baylor College of Medicine and the Board of Trustees for Baylor Scott & White Health. In September 2010, Judge Starr established his first fundraising priority: The President’s Scholarship Initiative, a three-year challenge to raise $100 million for student scholarships which was completed five months ahead of its goal. He also is leading Baylor into the future under Pro Futuris, a new strategic vision developed with the collective wisdom of the extended Baylor family. Judge Starr has argued 36 cases before the U.S. Supreme Court, including 25 cases during his service as Solicitor General of the United States from 1989-93. He also served as United States Circuit Judge for the District of Columbia Circuit from 1983 to 1989, as law clerk to Chief Justice Warren E. Burger from 1975 to 1977 and as law clerk to Fifth Circuit Judge David W. Dyer from 1973 to 1974. Starr was appointed to serve as Independent Counsel for five investigations, including Whitewater, from 1994 to 1999. Prior to coming to Baylor, Judge Starr served for six years as The Duane and Kelly Roberts Dean and Professor of Law at Pepperdine, where he taught current constitutional issues and civil procedure. He has also been of counsel to the law firm of Kirkland & Ellis LLP, where he was a partner from 1993 to 2004, specializing in appellate work, antitrust, federal courts, federal jurisdiction and constitutional law. Judge Starr previously taught constitutional law as an adjunct professor at New York University School of Law and was a distinguished visiting professor at George Mason University School of Law and Chapman Law School. He is admitted to practice in California, the District of Columbia, Virginia and the U.S. Supreme Court. Judge Starr is the author of more than 25 publications, and his book, First Among Equals: The Supreme Court in American Life, published in 2002, was praised by U.S. Circuit Judge David B. Sentelle as "eminently readable and informative...not just the best treatment to-date of the Court after (Chief Justice Earl) Warren, it is likely to have that distinction for a long, long time." For more information, contact Courtney Devney.